My Ebuddy, Josh Bauman of Caffeinated Toothpaste, is raising funds to get his next book printed. Sheck it oot. kinda hard to read. its unbearable, really. I can’t bear these threads anymore. Now just paws for a second. Will there be a followup comic? I like how sceptical the bear looks in panel five. Thanks, Gabe 🙂 I’m glad the heartbreak was conveyed properly. Were the other three consumed for their lackluster performances? You, sir, are a genius. Truly. You are near to a Golden Bear! I’ve only been reading for a couple of months, but I’m confident enough to say this is probably the greatest thing you’ve ever done. Certainly the funniest yet most adorable thing I’ve seen in months. Thanks! I was proud of this one! I wasted a whole day going through all of them. I love em. Thanks for reading them all. That is pretty awesome, Austin. 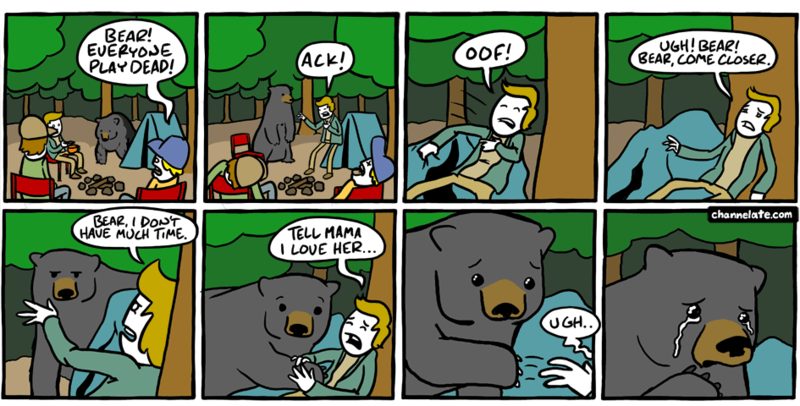 OH I love this one… Bears are people too! btw- have you asked your therapist about your obsession with bears? lol Hil you’re so funny. But honestly I’m afraid to ask her what the significance of bears means. Good to know! What kind of merch were you thinking of? LOL Thank you for following my suggestion. I’m gonna buy one now. Thank YOU for buying one. does he chomp him just to end his misery? he should chomp him either way. I kinda think that dude was eaten. Aw! That second to last face… So adorable!!!!! Oh no! How did I catch up?! I blew threw all of these in like, four days! Great work! AAAH. I need to draw comics at a frequency that doesn’t let this happem! Thanks for reading, David. I bearly got this one. This remains my absolute favorite of your comics. Simply amazing. This one is my absolute fav..! I love all the facial expressions.. Your comics are great Ryan..! Holy crap that bear is cute. Bear: “B-but I just wanted to say hey!” ?_? Wow, That is the very interesting post. it’s good i really appreciate like these stuff’s. I am not a comic love though some comics here are too awesome and I have started reading such for couple days and I am having my best time going through all such posts. This is certainly the very adorable story I have read. I just love how you welcome all the new members on your forum! One of the few times I like to share something really awesome that people gonna like and must share with their friends. I would like express my love for leather biker jacket that is made from real lamb leather. I have recently bought it and found it really awesome. It is not like a specially crafted leather biker jacket, even that a typical one with such a gleaming surface. Particularly, I love the shinny zippers that looks just awesome. Give it a try, I hope you will also fall in love with it. This leather motorcycle jacket is made from real lamb leather and given a hand-touch to finish that makes it just perfect to be worn in causal occasions. Thank you for interesting yet informative writing. I would like to let you know that you have been doing a great job by putting useful information and your opinion together. It’s been not more than a couple of days since i have started reading your articles and to be very honest, i have been impressed of your work. he was right now I’m your visitor. good work sir keep it up. I read your blog! You are a great person you shared a incredible information with people. peoples seek more things from there. peoples seek more things from there. Iam glad to see your posts. people takes alots of helpfull information from there and I want to see more posts like this. I truly enjoyed the experience of the experience of inquisitive about your article here,your article made a huge impact on my thinking.Thank you for sharing this amazing one post. keep us in your touch. I really like your post with incredible facts. Keep up the good work! You have a great sense of designing, you can even design your own game application by taking help of android mobile game development agencies. Share your design documents with them, they will make a dummy model and then start with the development process. Good and successful blog situation. The article is too little but valuable. I love the in sequence you share at this point. Nowadays cryptocurrency is growing faster and faster and people get huge profits. If you want to become a cryptocurrency miner, then before you buy any hardware, do your own research and then make a wise decision. Cryptocurrency mining can be beneficial if you use the right hardware for mining. wow, This is the really great post, I am interested in reading this post. https://www.filmstaroutfits.com/fantastic-beasts-2-gellert-grindelwald-coat is really like your blog, thank you so much. https://www.filmstaroutfits.com/fantastic-beasts-2-gellert-grindelwald-coat is really like your blog. It was so good to read about this all stuff. I really enjoy it. It was so nice to know what happening in bear in Camp. Thanks for sharing with us. I found your this post while searching for some related information on blog search…Its a good post. Your skills and uniqness if u came that up by yourself. Carry on doing this it’s great The things I draw are not really comic drawings but manga and I have to have a picture in front of me. Are you looking for ways to increase organic web traffic? No one can do this better than the experienced SEO agency. As SEO methods that will get you the desired results need to be dynamic and versatile too. So, don’t try SEO on your own. Thanks for the nice blog. It was very useful for me. I’m happy I found this blog.